Match Three Pirates! Heir to Davy Jones is rated 2.9 out of 5 by 16. Rated 5 out of 5 by csivell from Much better than I expected !! Give it a try. Once I had actually figured the moves, I really enjoyed this game. I do wish that it had not been timed (??) .Glad i bought it tho' and will be looking out for another from this stable !! Rated 5 out of 5 by golemol from O, Pirates! I love the pirate theme. Cool game as for me. The gameplay is standard, but very stylish graphics. Sound design is also on the level. An interesting story about the adventures of Bobby. I also liked the caravel with improvements. I will wait for the continuation of the game. Rated 5 out of 5 by whoopcaterpiller from Match Three Pirates! Heir to Davy Jones Hi all ! This is a fun limited moves match 3. I found it fun and entertaining. It is a must buy for me. Rated 5 out of 5 by pennmom36 from AHOY ME HEARTIES! 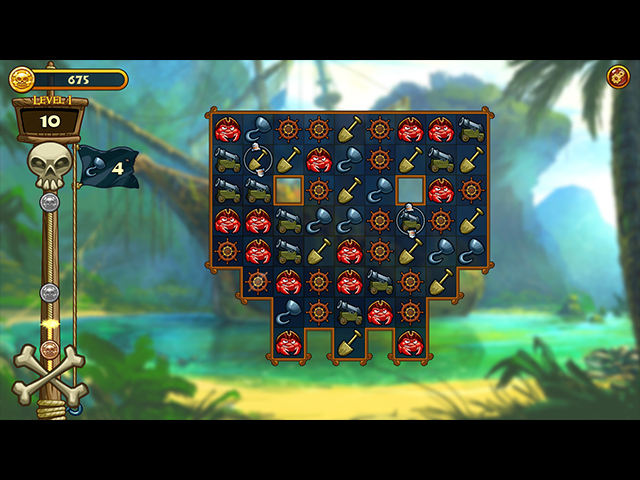 THIS MATCH 3 GAME WON'T BE WALKING YE PLANK TO DAVY JONES LOCKER Arrr, mates, I'm not normally a fan of Match 3 games that are only available in a Limited Moves Mode, but this one is pretty fun! I also really liked that you are given the choice to continue playing after completing the level goals if you have any Moves remaining. You can opt to keep playing until your moves are depleted, or you can continue on to the next level, a feature I don't think I've seen implemented in a Match 3 game before. I have noticed that just because you have met the goal requirements, it doesn't necessarily mean that you have earned all 3 available Skulls, so you may have to continue playing if you want to earn all 3. 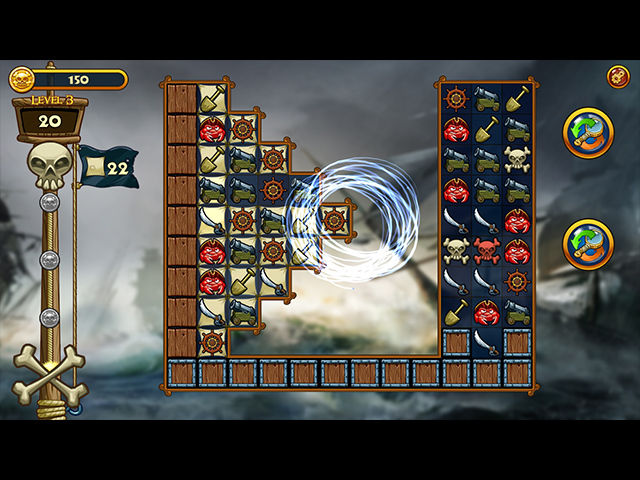 This is a Swap Type, Limited Moves Match 3 game with specific goals for each level, such as making a specified number of specified tiles, making matches on all gold tiles, opening Treasure Chests, shooing away pesky Seagulls who steal your Doubloons or chasing away mischevious Monkeys who will nail down tiles when you aren't looking! There are also various obstacles of rope-bound tiles, wooden crates and various bad-guy obstacles like Jolly Roger Skull & Bones that multiply with every match made. The Skulls & Doubloons you earn are used to upgrade the Schooner (11 Schooner upgrades), as well as purchase and use Bonuses (9 Bonuses available) The upgrades are percentage based upgrades, and the Bonuses are used during the Match 3 games at your discretion, such as a Hammer or Bombs. You can choose 4 Bonuses at the start of the level, however, you have to pay for the use of the Bonuses with the doubloons you earn. 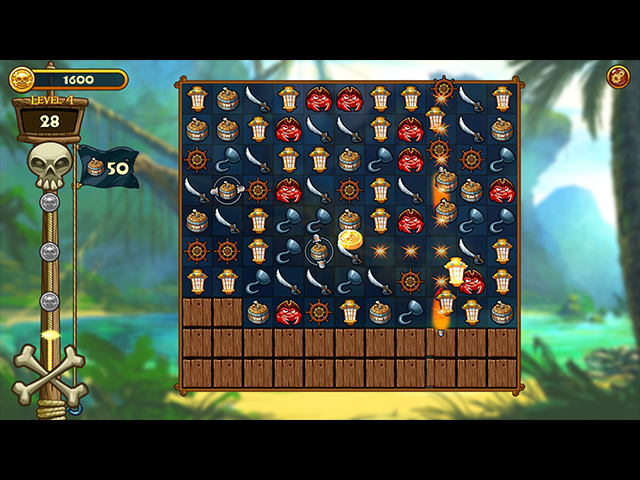 Large Matches will earn tile specific bonuses on the board such as Directional column or row busters, Bombs etc. but unlike a lot of recent M3 games, the bonuses aren't as obtained and there aren't a hundred of them on the board which practically plays the game for you. Graphium Studio has really impressed me with this game, besides, who doesn't love a chance to talk like a pirate, arrr!?! Rated 4 out of 5 by mkgermany from Challenging but fun! Yes, it's another match-3 game, but there are quite a few things that make it different - and fun. I don't usually like limited moves games, but this one is addictive: I find myself re-playing a level just to get the desired outcome. Another reviewer gave a good summary of game play, so I won't repeat that here. I mostly wanted to say how much of a challenge this game is - speed and strategy are important! 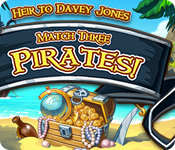 Rated 3 out of 5 by biscuitsmama from CUTE MATCH 3 MORE SUITED TO THE YOUNGER CROWD Match Three Pirates Heir to Davy Jones is a run-of-the-mill match 3 games that I didn’t find very exciting or interesting. I didn’t last more than 4 levels before I decided the game is not for me. I am guessing the game would appeal more to pre-teen boys who are quite taken with a pirate theme. Perhaps I didn’t understand the mechanics of the game but I couldn’t find an exit button and after several attempts at finding one, I finally hit CAD and exited the game that way. If you are crazy about pirate jig and cannon explosions you might enjoy this game far more than me. There are some absolutely excellent pirate based match 3 games to be found here at BFG but this isn’t one of them. Heir to Davy Jones seems rather simplistic and light, a very easy game that, as I mentioned earlier, is more suited to younger gamers and that is okay because kids need to have some computer fun time as well. Happy gaming! Rated 2 out of 5 by kgustavson from what's with the upgrade prices? So the story line is pretty cute, Kudos for that. The game play is fine (how exciting can a match-3 be?) but the cost of upgrades is just ridiculous and makes this a no-buy for me. So the first helper (hammer) is only 9 dubloons - great!! But the next items are 21, 27, or even more expensive; as you can only earn 3 coins max per level, you do the math on how long that'll take. I don't get the developer's take on this at all, and it ruins the game for me. Rated 2 out of 5 by bessiegirl from timed game, no option, no buy Good grief, who still designs games without an option to play without a timer? Besides that, which definitely made it a "no buy" for me, I found the game to be a bit old school. A lot of dialog and didn't offer anything more than basic match 3. I don't understand the high reviews. I was bored after the first few levels, especially since it basically makes you play the same level over and over until you can beat the timer. Not for me.